Dropbox is a file hosting service by Dropbox Inc. It allows you to store files in cloud storage and synchronize them across devices logged on with same Dropbox ID. 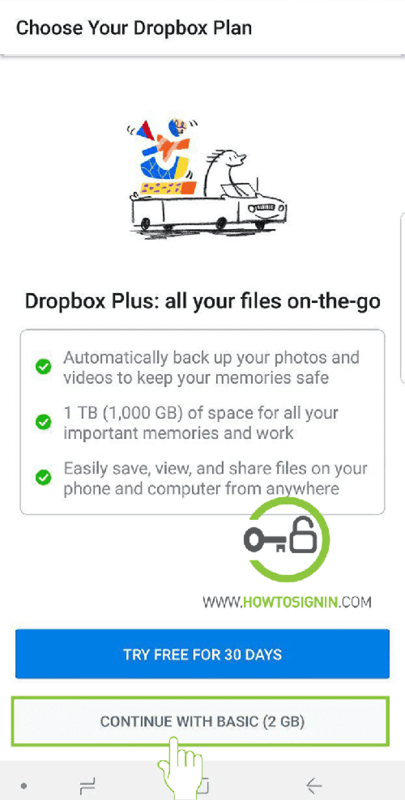 It works on a Freemium basis, i.e., you get 2 GB of free storage after Dropbox sign up, and if you require more than 2 GB of storage, then you must use the paid version. In premium version, along with additional storage up to 1 TB, you’ll get other services like advanced sharing controls and remote wipe. 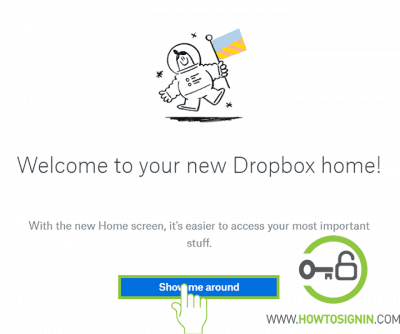 You can use Dropbox either via a web portal or through apps available for PC and mobile. You can create a new account via web-browser. Go to dropbox.com from the web-browser. You’ll get sign up form on the right sidebar. 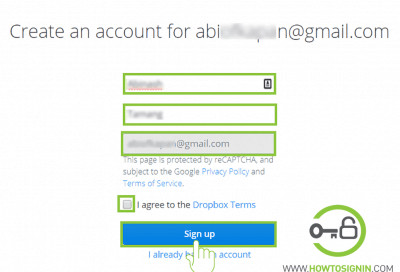 Email account for Dropbox registration. It can be Gmail, Hotmail, Yahoo or any other email. Password for the Dropbox account. Create a unique password as you shouldn’t use the same password for multiple accounts. 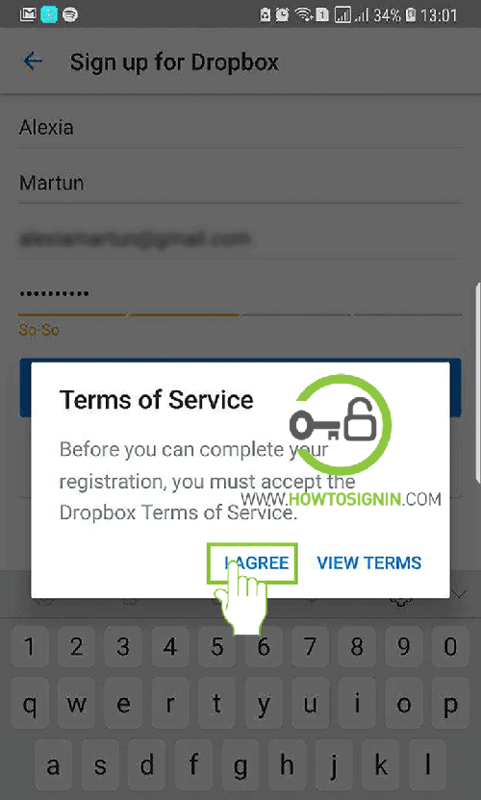 Check the box I agree to Dropbox Terms. Hit Sign up to further the registration process. You’ve to choose either you’d like to use Dropbox with a team or as an individual. Select Not now to the question ‘Will you need more than 2 GB of space?’ for a free account. For a premium account, choose Yes. Choose any plan of the layout and select Get started with Dropbox. Click Show me around to know the basic functionality. You need to verify your email address to see folders shared with you. Click Send verification email. 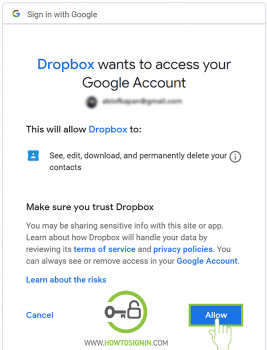 Go to your email inbox, and verify your dropbox. 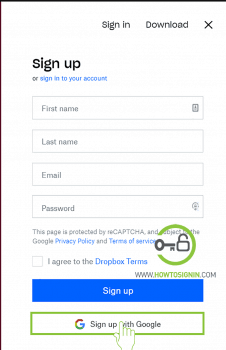 You can sign up for free Dropbox account with Google. 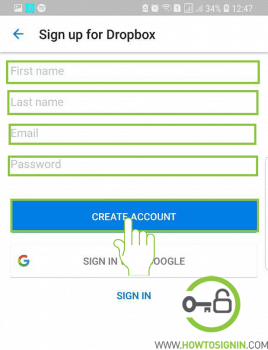 When you create an account using Google, you don’t have to enter separate email/password to access Dropbox. 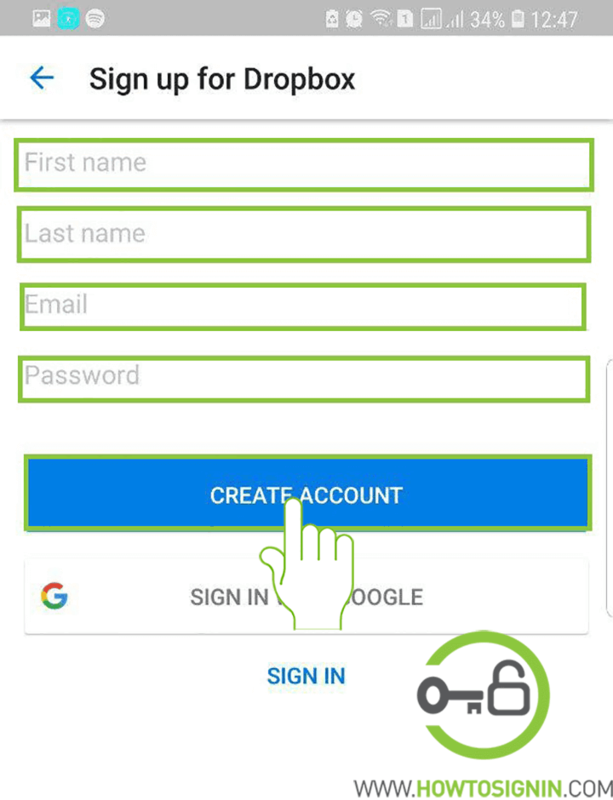 Click Sign up with Google. A pop-up window will appear. Log in to your Google account. 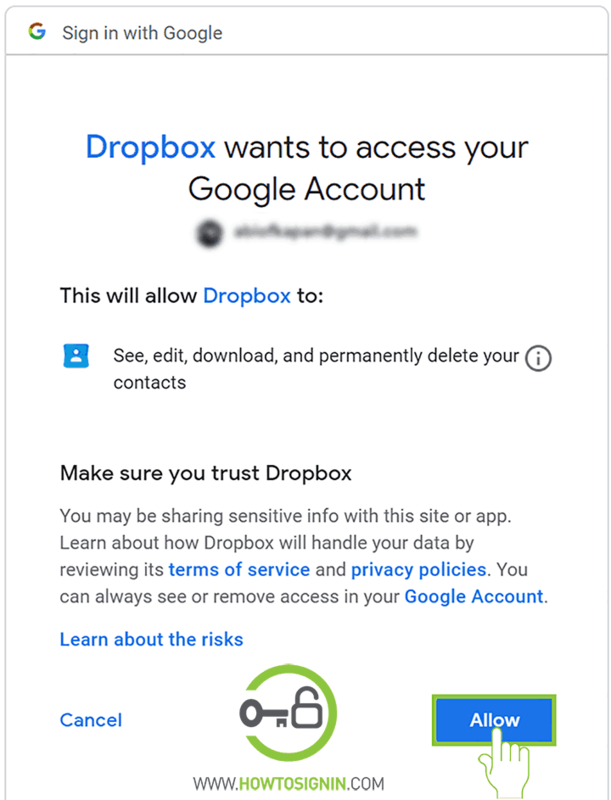 Dropbox wants to access your Google account, hit Allow. Update your name if you want to use a different name, otherwise, agree on the Dropbox Terms and select Sign up. Now you’ll get multiple options, choose according to your need. 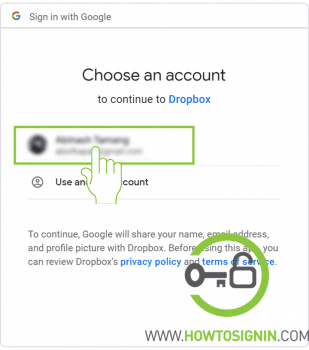 You can make a new Dropbox account via iPhone and Android phone. Set up Dropbox on the phone. Download the Dropbox app from Google Play Store or Apple. Open the app from the mobile menu. Tap Sign Up from the menu. Enter your first and last name in the respective field. Type the email you want to register with. 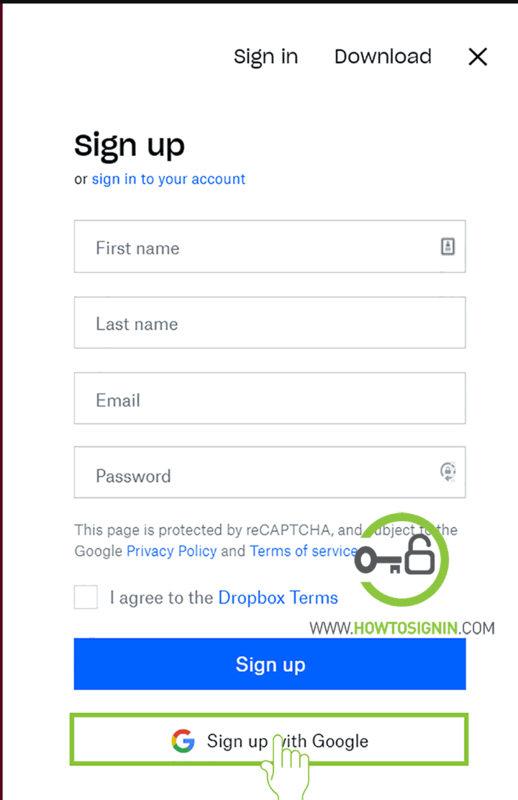 Create a password for the new Dropbox account. 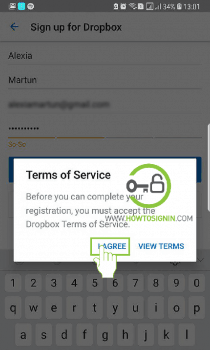 Accept the Dropbox terms of service by tapping I Agree. You may need to enter the captcha code. 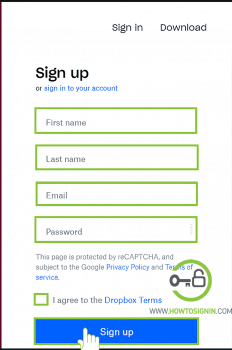 Check the bot ‘I’m not a robot.’ After entering the captcha, tap Verify. You can choose any option, Try free for 30 days or Continue with basic (2 GB). Upload photos from your phone or skip the step. You can connect to a computer by downloading Dropbox on your computer or skip it. Now your new account is ready to use.